A 9x9 board is the recommended board for beginners (or any Go player looking for a quick game, e.g. during coffee break...). The reduced size allows for shorter and simpler (not easier) games. 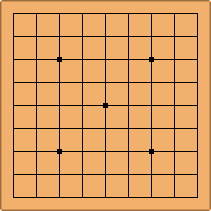 It is a convenient size because it can be played on the lines of a Western Chess board (which has 8x8 squares, thus 9x9 lines). Tengen, the middle of the board, is an obvious first move. In 9x9 Go tactics are important. Strategy doesn't really apply. Less complex than 19x19 Go, it still makes an interesting challenge for professionals. PlatinumDragon: In my opinion and experience, the difference between a 25-kyu and 1-kyu is less than 1 stone on a 9x9 board. Balance138? : I don't know what the difference is, but I give 4 stones to 25 kyu players and I am only 12 kyu. If you are wondering about 9x9 handicap and komi, see Handicap for Smaller Board Sizes. In a discussion of 9x9 games, a KGS player, Alexanro, suggested that there is a principle of maximum number of groups: Alexander's Law of 9x9.